The Mother's Service Society was founded in 1969 in Pondicherry, South India, with a view to studying and applying the basic laws of human development based on the theory of creation and evolution of consciousness propounded by Sri Aurobindo and The Mother. MSS is an official international center of the World Academy of Art & Science collaborating with the Academy on research projects and publishing activities related to economics, social development, international security and global governance. MSS Research - The Society conducts original research applying Sri Aurobindo’s thought to social evolution, human development, economics, education, management, psychology, science and literature. A selection of research papers are hosted on this site. Hundreds more can be found on www.mssresearch.org. Primrose School - MSS operates a world-class primary and secondary school in Pondicherry applying advanced methods of early childhood and computer aided education. A selection of articles are contained on this site. For more information, please see www.primroseschool.org. Karmayogi.net - The Society publishes a wide range of books and articles on personal accomplishment, psychological growth and spirituality in life and other topics in English and Tamil. It also published a monthly Tamil journal Malandha Jeevayam on spirituality and prosperity. A selection of articles are contained on this site. For access to the complete collection of books and back issues of the journal see www.karmayogi.net. For further information or inquiries, please use the contact form. Romance Eternal – a website with articles and an expert system for personal counseling on intimate relationships. Tenfold-Sales.com – a web-based personal training program on the psychology of accomplishment. PrideandPrejudice.info – an in-depth analysis of the character of life and human nature in Jane Austen’s famous novel. 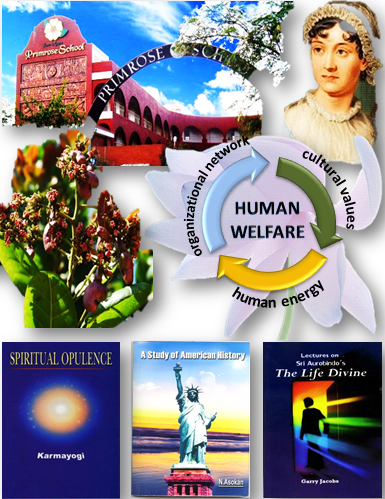 Human Science wiki – an encyclopaedia on social development, psychological growth, character of life and spirituality.